LAKE OSWEGO, Ore., Sept. 13, 2017 /PRNewswire/ -- The Greenbrier Companies, Inc. (NYSE: GBX) today announced that it has completed production on its 50,000th covered hopper railcar. This milestone follows Greenbrier's announcement in February of the production of its 100,000th intermodal double stack railcar. These achievements demonstrate Greenbrier's leadership in innovative engineering and manufacturing excellence within North America's competitive freight railcar markets. These landmark events also exemplify Greenbrier's transformation in recent years from a limited builder of specialized railcars to a broad-based manufacturer of virtually all railcar types. Greenbrier built its first covered hopper railcar over 11 years ago. Today, Greenbrier builds a full line of small, medium and large covered hopper railcars with freight carrying capacities from 3,250 cubic feet up to 6,580 cubic feet. Covered hoppers are the largest single railcar type in service, comprising more than one-third of the North America fleet. Covered hoppers are integral to North American freight movement, carrying a wide variety of dry bulk including grain and agricultural products, plastics and chemicals, and nonmetallic minerals, including sand and cement. From the beginning Greenbrier has listened to its customers, building the best railcar for their needs. This has allowed Greenbrier to make meaningful advancements in covered hopper technology that enhance rail transportation for a broad range of commodities. 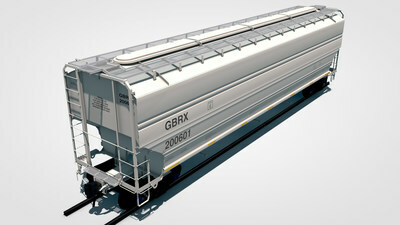 Most recently, Greenbrier has developed two new medium covered hopper railcar designs. One of the new cover hoppers is designed to transport lighter weight agricultural products. It features a carrying capacity of 5,446 cubic feet with a length of 56 feet and a light weight of 59,500 pounds that is lighter than existing railcars. Greenbrier's new covered hopper design for transporting heavy agricultural products is 54 feet long, two feet shorter than its closest competition, with a carrying capacity of 5,100 cubic feet and a light weight of 58,700 pounds. This covered hopper improves freight mobility through more efficient railroad operations. An additional enhancement to Greenbrier's covered hopper railcars includes an updated roofline that improves loading and unloading access for increased transloading efficiency. "Our latest covered hopper railcars are best in class. Both feature a recent patent-pending design for reduced weight," said Mark Rittenbaum, Executive Vice President, Commercial and Leasing. "We are focused on increasing cubic capacity and reducing length and weight in all Greenbrier covered hopper designs. Greenbrier prioritizes innovation and design so that we always meet the needs of our customers and capitalize on modernization opportunities to achieve market growth." "Greenbrier strives to diversify our product offerings and access new markets. We are relentless about improving the performance of our railcars to meet the needs of our customers," commented William A. Furman, Chairman and CEO. "This is our second landmark achievement in 2017, following our 100,000th intermodal double stack unit produced at Gunderson earlier this year. This latest milestone highlights Greenbrier's leadership in the railcar industry. It also solidifies our position as a global manufacturer, with headquarters in the United States, and major manufacturing operations on three continents. I am grateful for all our employees and customers who will always be essential to Greenbrier's growth and success." To learn more about Greenbrier, its innovative covered hopper technology, and its entire line of railcar products and services, please join Greenbrier at Railway Interchange in Indianapolis, September 17-19, 2017. Railway Interchange is the largest combined railway exhibition and technical conference in North America, attended by nearly 10,000 industry professionals from around the globe. Greenbrier­­—headquartered in Lake Oswego, Oregon—is a leading international supplier of equipment and services to global freight transportation markets. Greenbrier designs, builds and markets freight railcars and marine barges in North America. Greenbrier Europe is an end-to-end freight railcar manufacturing, engineering and repair business with operations in Poland and Romania that serves customers across Europe and in the Middle East. Greenbrier builds freight railcars and rail castings in Brazil through two separate strategic partnerships. We are a leading provider of wheel services, parts, railcar management & regulatory compliance services and leasing services to railroads and related transportation industries in North America. Greenbrier offers freight railcar repair, refurbishment and retrofitting services in North America through a joint venture partnership with Watco Companies, LLC. Through other joint ventures, we produce rail castings, tank heads and other railcar components. Greenbrier owns a lease fleet of over 9,000 railcars and performs management services for 267,000 railcars. Learn more about Greenbrier at www.gbrx.com.